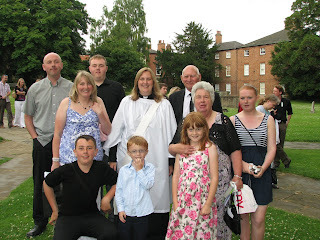 Denise Dodd, from St Peter and St Paul's Church, Hucknall, was ordained deacon in Southwell Minister a few weeks ago. I was parish priest in Hucknall - we lived there from 1975-1986 - and knew all the Dodd family. It is such a great blessing to now see her committed to the Lord's work in ordained ministry in England. "I know within that each day God is blessing me. I so passionately want to do the ministry to which God has called me.... Everyday is a blessing and honour, knowing that God has really called "little shy Dee" to be a servant for his precious people! There is one thing that I must say to you, which I have wanted to do since I came back to faith in my late teens and that is, "Thank you for being an ambassador for God, so that I could receive from an early age the greatest gift of all, a loving relationship with God, not just for me but also for Mum, Suzanne & Colin". Thank you Denise, and may God bless you in your new ministry.